UC Davis biology and agricultural engineering professor Shrini Upadhyaya and his team designed a sensor that attaches to a single leaf to measure temperature, light, wind, and humidity to help optimize plant irrigation. The key to effective irrigation is giving crops the right amount of water in the right place at the right time. Easier said than done, but new technology developed at UC Davis is giving growers a convenient way to find that sweet spot. "Now growers don't even have to go to the field to decide when, where, and how much to irrigate," said Shrinivasa Upadhyaya, a UC Davis professor of biological and agricultural engineering. "We developed a suite of sensors that delivers real-time plant-stress data to your computer or mobile device." 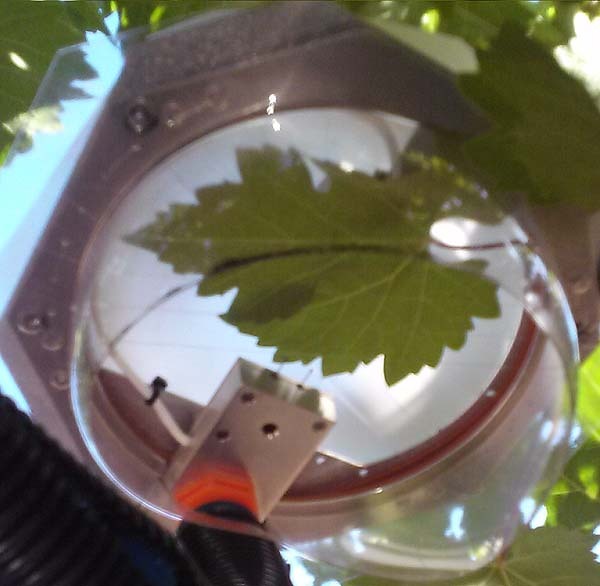 The technology is now available from Cermetek Microelectronics in a device called LeafMon, designed for vineyards, almond and walnut orchards. As the research expands, more crops may come online. Frank Stempski, sales manager for the Milpitas-based company, says LeafMon will help growers save water and improve crop quality and yield. "The goal is to keep crops in near ideal conditions, at all times," Stempski said. Traditionally, growers have irrigated on a schedule tied to weather conditions. More recently, soil sensors have helped growers water only when their soil is dry. But that can be misleading. "Just because soil is dry near the surface, doesn't mean plants are suffering," Upadhyaya explained. "And just because soil is moist, doesn't mean plants are happy. Orchard and vineyard crops have extensive root zones, so sensing moisture at a certain depth doesn't guarantee the plant can access that water." 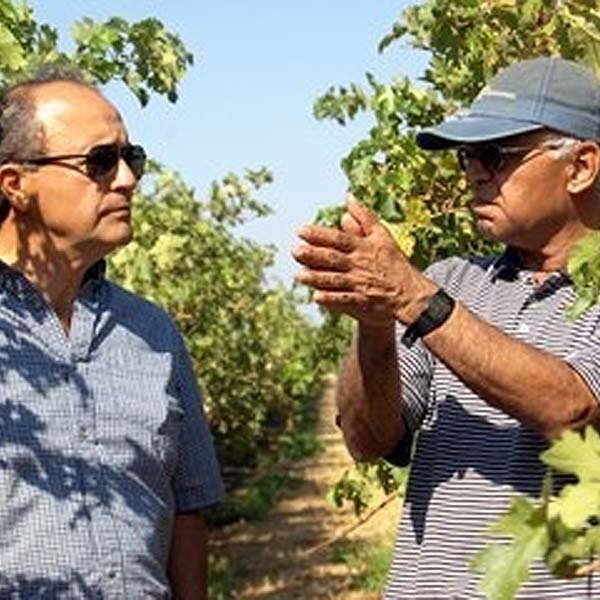 Gallo Winery research scientist Luis Sanchez (L) and Shrini Upadhyaya (R) in a vineyard where a research team is conducting tests with the sensor. UC Davis researchers helped develop pressure chambers to provide a more accurate read by gauging how hard a plant is working to pull moisture from the soil. Upadhyaya and his team have taken it one step further by designing a suite of sensors that attaches to a single, shaded leaf and measures leaf temperature, light, wind speed, relative humidity, and air temperature - all which affect a plant's water needs. "And the sensors interface with a wireless network to feed you this information 24/7," Upadhyaya said. "It's essentially effortless compared to pressure chambers, which you have to bring to the field at midday to directly measure water stress." Since the system provides a continual read of plant-water stress, growers can customize irrigation accordingly. Some crops, like grapes, benefit from a certain level of stress at various points during the growing season. Luis Sanchez, senior research scientist with E&J Gallo Winery, says the sensor could also work well in tandem with other high-tech irrigation scheduling methods based on remote sensing. "It could be a very useful tool for verifying our satellite-based irrigation schedules," Sanchez said. "The plant-stress sensor system could help us fine-tune our irrigation to improve crop quality and yield." To learn more about Cermetek LeafMon and AquaMon solutions for optimized irrigation by contacting us at 408-942-2200, sales@cermetek.com, or on the web at www.cermetek.com.